Summary: In 1973, Fleer released a set of stickers that spoofed magazine covers called Crazy Covers. Since Topps wacky packages never spoofed magazines (until later on), these stickers complement a wacky package collection quite nicely. I have included a Crazy Covers Checklist for reference. 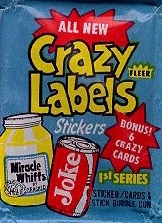 Summary: In 1979, Fleer released their own wacky package style stickers called Crazy Labels. There was only a single set of 64 stickers. The artwork and detail were not quite as good as Topps stickers, but there were some interesting titles. I have included a Crazy Labels Checklist for reference.